Daniel 7 is a key chapter in understanding all that follows regarding Jesus’ ministry. It is probably here that Jesus draws his use of “Son of Man,” or “Human One” in the Common English Bible. It is a vision of distractions and a vision that calls us to focus. The distractions are the violent actions of this world. They really are like car accidents. We just can’t help but slow down and watch. What DO we do about human trafficking? What DO we do about unjust laws or unjust jury decisions that seem to favor race or economic status? What DO we do about the wars, the protests… and on and on. There ARE things to do, but it when we regain our focus that we can begin to see the work of the Kingdom once again. The key for Daniel is seeing the Ancient of Days take the throne and open the books. There is ONE who will take command and control. Yet, even Daniel could get distracted. We let the bragging of this world get to us. It calls our attention away. But the realization is that all the beasts of this world have is words. Ultimately, everything rests with the Ancient of Days. He passes on that authority to the Son of Man. To HIM belongs the everlasting dominion (Daniel 7:14). This world IS noisy. The beasts of this age rage and brag. Our attention needs to be focused on the ONE who reigns. There is ONE who rules. And HE will deal with the bragging of the beasts of this world. Treasure Christ. In all pursuits, know he is the source and HE is the treasure. He is the treasure that can never be exhausted. Cokesbury had a huge sale last week and it included the Common English Study Bible. I was able to obtain this translation when it first came out through the generosity of the publisher, and I’ve found it to be a refreshing translation. It certainly has its “quirks,” but for common reading (and for me it’s so helpful in reading the Deuterocanonical books) it’s a nice translation. 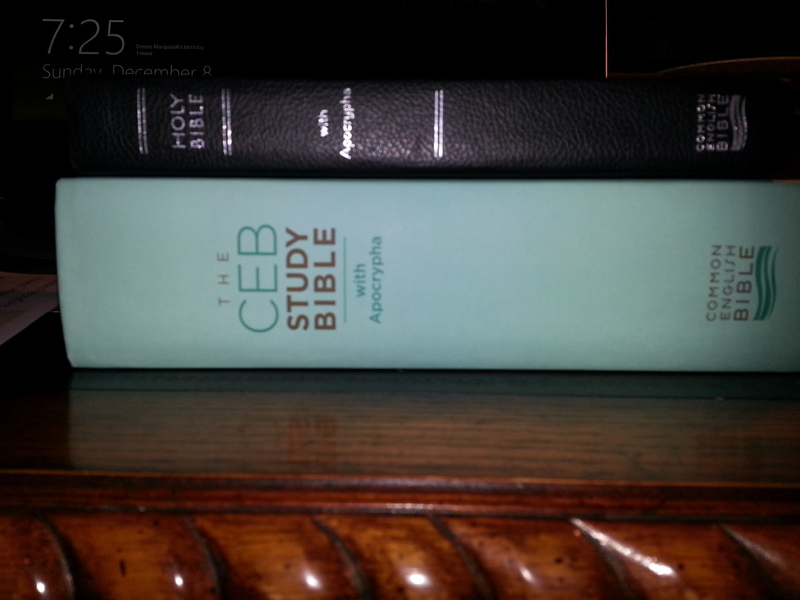 I have found myself using the CEB and NIV together the past year or so. The Study Bible is a nice addition. 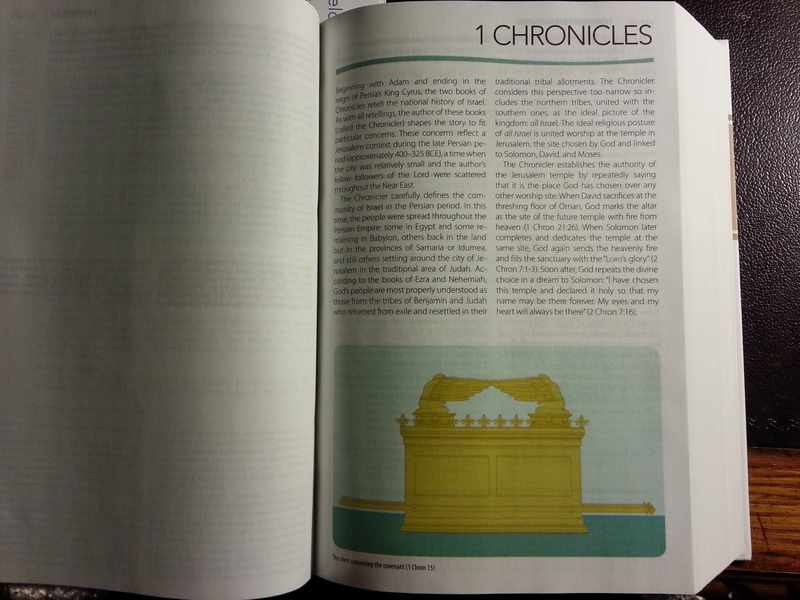 I would compare it to the NIV Study Bible in purpose. It helps the reader read the Bible. 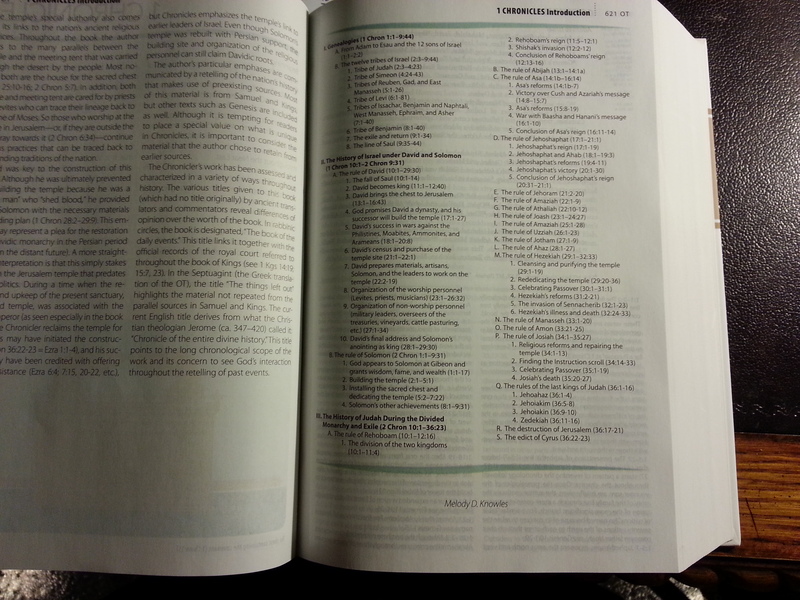 I find the ESV Study Bible gets into some depth that stretches into study and theology. To this point (and it’s early for me) the CEB Study Bible has put together a tool to help the common believer simply read better. I purchased the hardcover edition with the Apocrypha, so let me start out by saying this thing isn’t going into my briefcase! This picture has my first copy of the Common English Bible (with Apocrypha) on top of the CEB Study Bible. To put it bluntly… this thing is HUGE. The type font is not too small. There is color everywhere. Pictures are not overwhelming, but useful. The sidebars offer very helpful insights into definitions or cultural issues or textual issues of the particular passage. Typically I am more of a fan of a plain text Bible, so I am grateful I have a black letter CEB with Apocrypha. But this study Bible, I think, is very helpful for those wanting just some basic insights into what is going on in the passage. While this translation, like very translation these days, will fall victim to labeling (too “Reform,” too “Conservative,” too “liberal”) I think, as a “conservative” Christian, this translation is extremely helpful in reading the text well. I also think this study Bible will be helpful to open up passages a little more clearly, in the vein of the NIV Study Bible. Translation fun. The literal use of a word, which the ESV uses in Jeremiah 3:3 is, um, not helpful. Here is a comparison at Biblegateway. Strengths and weaknesses of translations are a key reason I like having so much available either online (like Biblegateway) or digitally (like Olive Tree or Logos). Just watch out for your forehead! Since the arrival of the Common English Bible, I have been intrigued by the simple approach to translation. It is designed to make the Bible clear. For lifelong Christians, that isn’t easy. I have trouble still with calling Jesus “the Human One,” and calling the ark a box. But where I see how the CEB excels is in the Apocrypha. I’m not familiar with the Apocrypha, so reading the CEB helps me flow in the text much easier than the NRSV. It’s actually a pleasure reading the Apocrypha with the CEB. The CEB Study Bible is now out and I’ve had a copy of the Gospel of Mark for awhile. 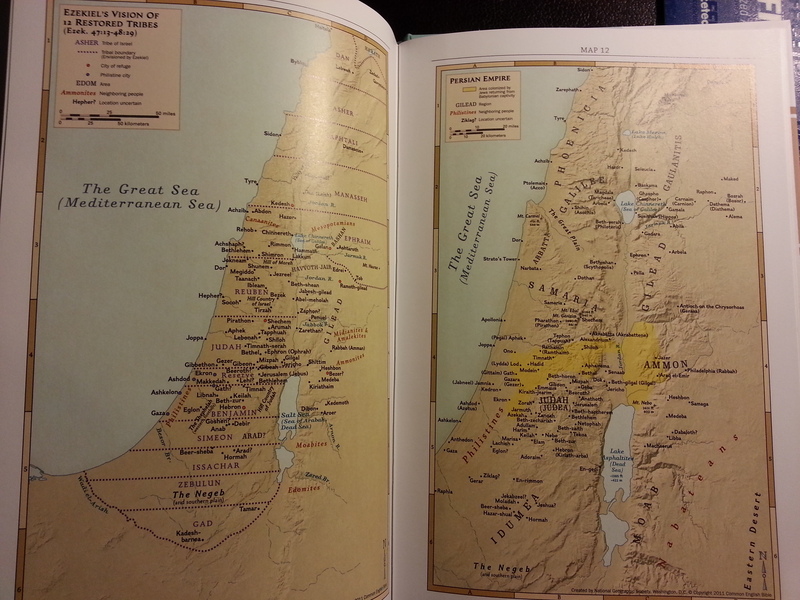 The sample CEB Study Bible reveals a simple study Bible. The notes are very simple. They do not try to push “doctrine.” They try to reveal clarity. There are sidebars in the main text that explore a subject a bit more deeply. This isn’t the ESV Study Bible, to be sure. It’s not trying to overwhelm you with notes. It’s trying to get the reader a bit more engaged in the text. The approach to Scripture is revealed in an intro article by Joel Green. It’s called “The Authority of Scripture,” and I thought it was well done. This text is helpful for anyone thinking about scripture’s authority, for two reasons. First, it reminds us of the claim of our faith, that scripture has its origins in the aims and voice of God… Scripture beats witness to God because God enables speech about God and God’s activity in the world. Second, it reminds us of the purpose or direction of scripture’s authority. The role of scripture isn’t to teach us lessons about history, medicine, archaeology, architecture, science, geography, and so on… Instead, engagement with scripture should produce this: “that the person who belongs to God can be equipped to do everything that is good.” We exhibit our best beliefs about the Bible not so much by what we say about the Bible but through scripture-shaped hearts and lives. This is a Bible that might be considered as a good alternative to the NIV Study Bible. I will still utilize the NIV far more, but the CEB continues to impress me with their aim in getting people INTO the Scriptures. Last Advent season I was part of the blogger series for the Common English Bible. They extended their blogging series through Lent, then to Pentecost, so I spent many months using the Common English Bible along with the NIV2011 in my teaching and preaching. Once the blogging event was over last spring, I still found myself drawn to the Common English Bible. While my main teaching and preaching continued to be from the NIV, I would always refer to the Common English Bible for a fresh look. The more I kept using the Bible, the more I have grown to really admire this translation. It is completely “modern,” in that the vernacular will wear out in about ten years or less. It means fresh updates frequently. That’s one downside. I’m still getting through that “Human One” vs. the “Son of Man” thing. That’s another downside. But this translation is really a decent read for me. I rarely trip up over words if I read it publicly. The reading is very smooth. Also, I am desiring more and more to have access to the Deuterocanonical Books, and my edition of the CEB in print and on my Olive Tree Reader has that. While I don’t access those books often, I want to have them available. 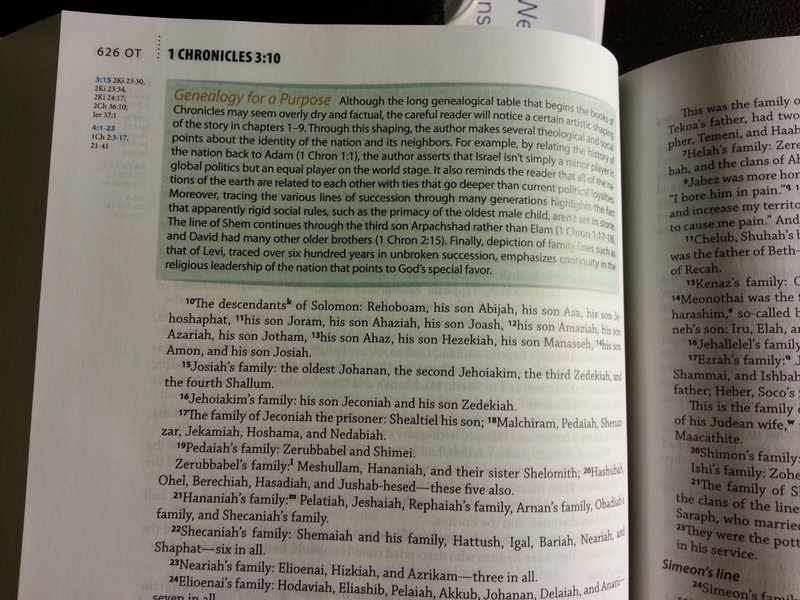 Reading the Deuterocanonical Books in the CEB is refreshing. I think this is a good translation to give to people who can’t slog through a King James like experience. It is easier to get into the text, and that should be the point. It is a faithful translation, in my view, of Orthodox Christianity, and useful for study and reading.